Kelly is originally from Easthampton Massachusetts. She and her husband Jay moved to Myrtle Beach in 2004. 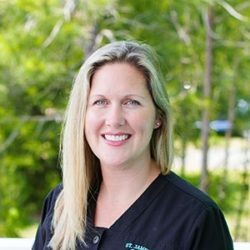 Kelly graduated from Horry Georgetown Technical College in 2007 with an Associate in Health Science degree for Dental Hygiene. Kelly and Jay have 2 children Aubrey and Blake. In her free time she enjoys going to the beach, taking her Golden fur baby for walks and spending time with family and friends.